Oh, hello. I have a blog now. A proper one with words and everything. Isn't this exciting. I have a website now too! The first episode of Burial at Sea came out a few months ago and, frankly, wasn’t anything special. It didn’t do anything ‘wrong’ per se, but it was short and didn’t even attempt to do anything new gameplay-wise. It was interesting to revisit Rapture, exploring it at its peak, but the majority of the episode essentially served as a simple switch of settings for the regular chaotic Booker gunplay and ‘hey, I found some money’ Elizabeth sidekick woes. Playing this episode was a gentle reminder of what didn’t really work in Infinite, namely the ridiculously unfitting ultraviolence and general lack of strategy required thanks to an over-abundance of powerful combat and tear options. (No, I don’t want to play on 1999 mode.) The Rapture setting does work in the gameplay’s favour this time, though, as random decapitations don’t seem quite as out of place in the dark, derelict undersea setting compared to the bright and cheery Columbian skyline. Overall, Episode One keeps you invested thanks to the subtle callbacks to the original Infinite campaign, building to a decent cliffhanger. Episode Two, meanwhile, pretty much goes out of its way from the very start to show off. Right from the beginning its clear that things are going to get pretty crazy - you’ll want to make sure you’re well versed on the events of the original game(s) before diving in. There’s a lot of what I like to call ‘narrative museum’ sequences, whereby you’re walking around, taking in details and simply allowing the story to progress linearly… but like in regular Infinite, these sequences continue to be executed really well. But that’s not the real reason to be impressed with this new episode - what really stands out is the change to the core gameplay. It’s no longer about chaos and mayhem - by playing as an Elizabeth without the ability to open inter-dimensional tears, suddenly you’re vulnerable, so the game takes on a new focus of stealth rather than brute force. With the Peeping Tom plasmid, you can see enemies through walls and turn invisible, while new weapons include a crossbow that can tranquillise, unleash sleeping gas or create noisy distractions. Even though these mechanics are ultimately half-baked (don’t expect Splinter Cell, and as is often the case in stealth games the tranquilliser darts are a bit too useful) I found this approach much more fulfilling than before. There’s no regenerating shield and for the first time in a BioShock game you don’t immediately respawn when you die. No vita-chamber grinding here, folks. The main disappointment in regards to the gameplay of both episodes is that there really isn’t much of the typical weapon upgrading or item scavenging, aside from the obligatory audio diary collectibles. 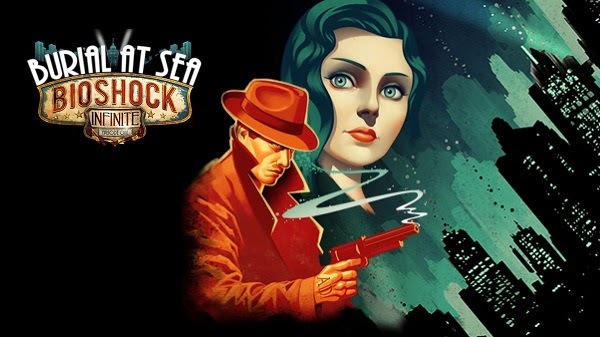 It’s a necessity due to the short play times of these episodes, so if you’re mainly into BioShock because of the lite-RPG elements and not because of the narrative, you might not find as much to love here. Clearly the focus is on story, and there’s a lot of obvious jigsaw-ing together of a whole bunch of strands to bridge the narratives of BioShock and BioShock Infinite. Considering the original game was made with no intention of involving a larger multiverse, it’s a nice surprise to find how neatly the story elements from Infinite are carried over to the familiar Rapture setting. I was worried, going in, that things were going to be a cluttered mess due to all the returning characters, but on balance, I think it worked out pretty well. If you’re a fan of Atlas, he has some particularly great moments here. The final revelation, even though you can kind of see it coming, is a convenient but undeniably smart and fan-pleasing way to draw a line under the convoluted plot. We’ve seen so many alternate versions of Booker and Elizabeth that after a while it becomes hard to care about their final fates, but this was probably the best possible way to wrap things up. I don’t doubt that BioShock will continue under the wing of a different developer, but now that we’ve ‘seen all the doors,’ it really doesn’t need to.